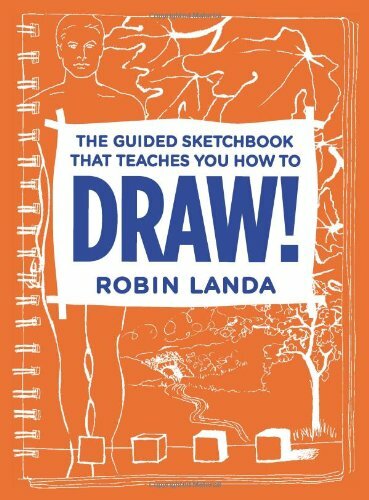 Book Review: The Guided Sketchbook That Teaches You How To DRAW! This book takes a rather academic approach to teach drawing. By academic, I mean lots of text and instructions with not much visuals. While the instructions are clear and easy to follow, the lessons would be more fun and impactful with more illustrated examples. Say for example, there's a section where it talks about values and the different effects that result. It's difficult to feel the effect when you're just reading about them and can't see them, although I must say that there are exercises in the book where you practice creating those values. Half the book are instructions with blank space for you to draw on so I guess you'll have lots of practice. By the way, the most important pages in the book are pages 10 and 11 on drawing what you see by measuring and judging the relationship between spaces and points. Many of the later lessons use the techniques taught in those two pages. Personally for me, I prefer a book on drawing instructions with lots of drawing, such as Bert Dodson's Keys to Drawing, or even Drawing on the Right Side of the Brain by Betty Edwards which has lots of text too. I guess I'm not particularly inspired by this book because it does not show what you can achieve after going through the lessons -- there aren't a lot of visual examples as I've mentioned. Before you buy, I highly recommend you use Amazon's Look Inside feature to preview the pages.